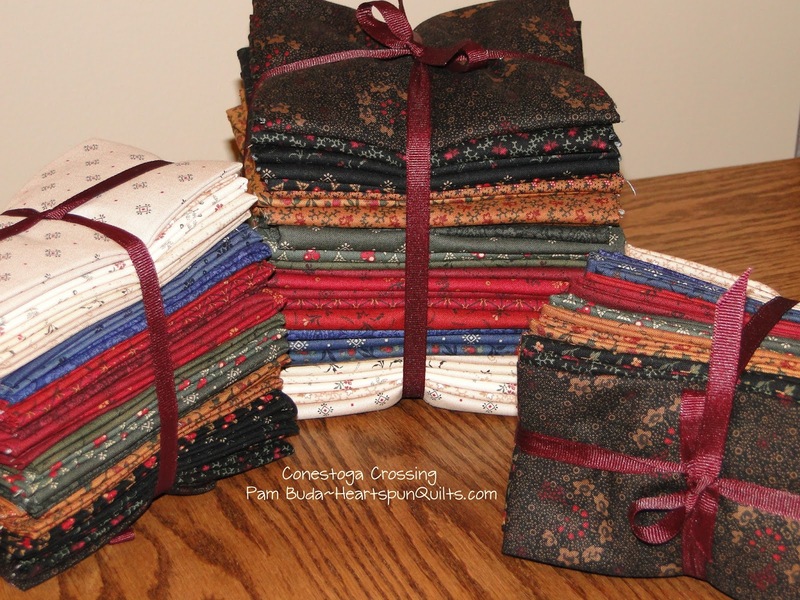 Conestoga Crossing Bundle Pre-Order Offer!! 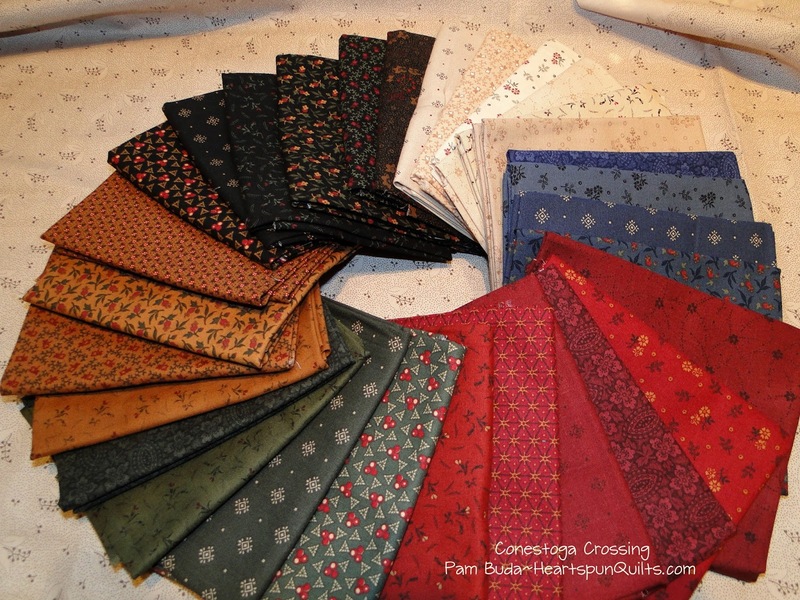 In just a week or so, my newest fabric collection, Conestoga Crossing, will be delivered to quilt shops everywhere! I'm so jazzed it is finally coming! I love this collection as it's in so many colors and prints. A 30 piece collection in all. Click here if you'd like to join the fun and find a participating quilt shop. I will have Fat Quarter and Fat Eighth bundles of the entire Conestoga Crossing collection. And, guess what?! They're on sale for 15% off!! Click here to order yours today while supplies last! On this special day of thanks I am filled with gratitude for my many blessings. Happy to be with family sharing a special meal. Thank you for visiting my blog, for your many kind and caring comments and emails, and of course for your business which makes it possible for me to continue to create wonderful fabrics and new quilt designs. 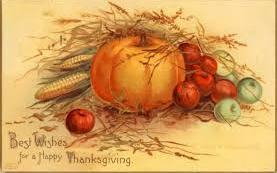 Wishing you and your family a very Happy Thanksgiving!! It's been awhile since I posted anything about finding time to sew for myself. I've been tracing lots of fabrics to prep for hand piecing while I recover from my next surgery (yeah - another one), and I've been waking up a little early now and then to finish making 1.5 inch Nine Patches for a Christmas present. This little quilt (12 x 15) will be given to my step-mom with whom I share this love of nineteenth century living. There is nothing she would want more, which as you know, makes giving a gift like this so worth the effort. I'm so excited to have it finished and it's off to be quilted. Cross that off the Christmas To-Do list!! I've been hand stitching some wool, working on Hexies, and tracing fabrics in the evening while watching TV. Nothing fun to share in a photo, but progress nonetheless. This assortment of pretty plums and purples are now available in Fat Quarter and Fat Eighth bundles. All are prints from a variety of my fabric collections for Marcus Fabrics. Here's the link to order. Hope you find some time to stitch to your hearts content this week. 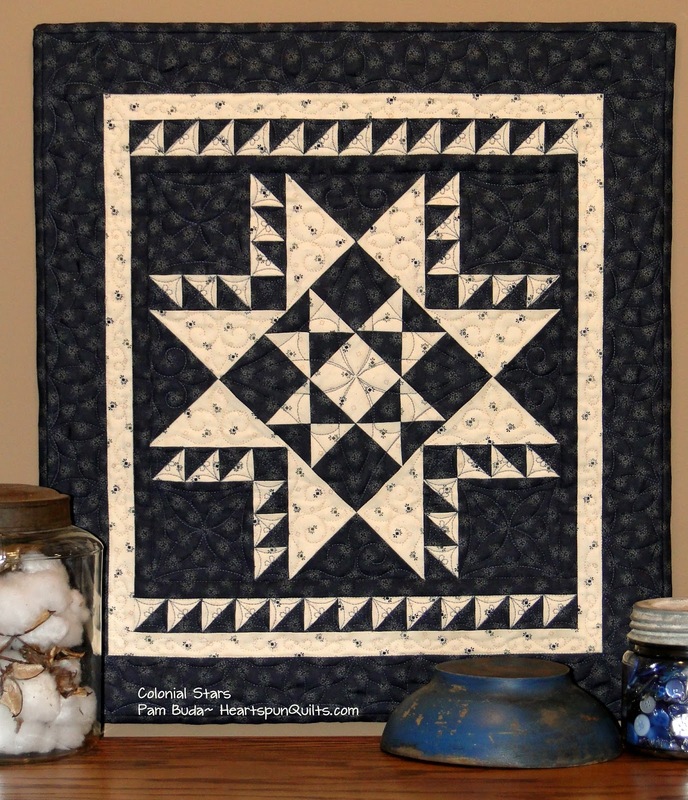 This little quilt, named Colonial Star, is a Limited Edition pattern release that I introduced a little while ago. I love it so much that I just had to make it again. This time, I chose green and red for the upcoming Christmas season. 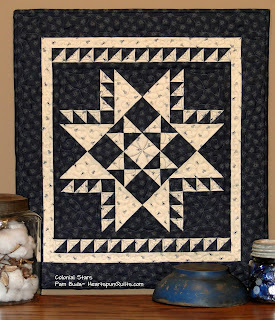 This adorable star quilt is easy to piece and is a pretty quick stitch. It would be a great addition to your holiday decorating and would also be a wonderful gift! There's a very limited amount of kits available in this colorway, so if you're interested, order today! 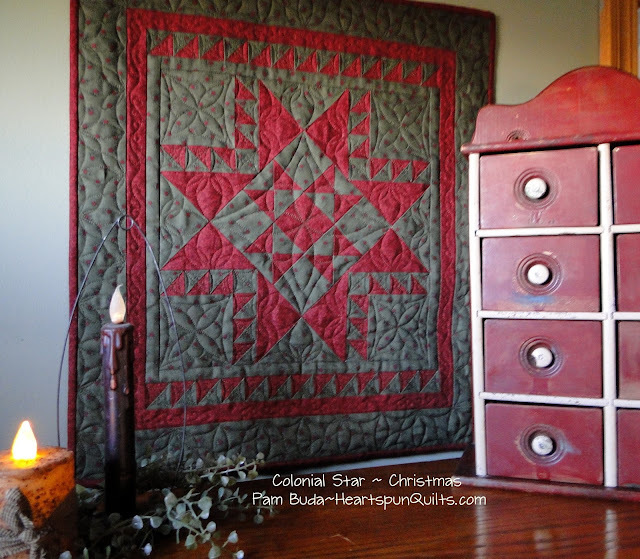 Colonial Star quilt size is 18" x 20". 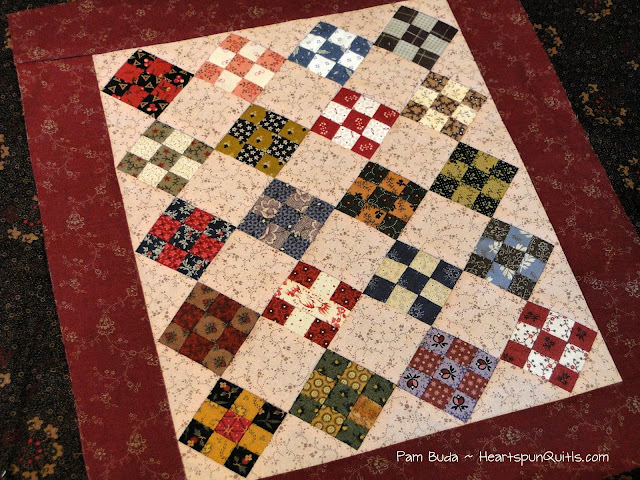 Kit includes the pattern and exact fabrics I used for the quilt top, binding and backing. Kit price is $42 plus shipping! Because this is a Limited Edition, the pattern is not sold separately. Click here to see the red & green fabrics and read all the details. I originally made it in traditional blue and white. While you're browsing, check out the complete fabric collection Fat Quarter and Fat Eighth bundles that are on sale! A little more than a week ago, these quilts were on display during Fall Market in Houston in the Marcus Fabrics booth. Well, actually, it was a special booth all its own called the Marcus Makers booth. All of the Marcus designers, i.e., Marcus Makers, were asked to create a special 24 inch quilt that would represent their style, fabrics and designs. What a wonderful array of quilts, don't you think? What a nice representation of traditional and modern. 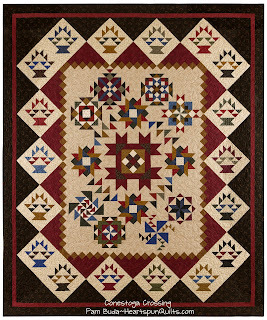 Conestoga Stitches is the quilt I made for the Marcus Makers booth. Those Nine Patch blocks are 1.5 inches finished and the Flying Geese are .75 x 1.5 finished. Yup....I went itty, bitty. Are you surprised? The fabrics are new from my upcoming Conestoga Crossing collection coming to your local quilt shop in December. Tiny blocks are a challenge for me, so that's one reason I chose to do that. And, those Flying Geese with the HST in the center were especially challenging as the HST's finished to 11/16ths!! I would be remiss to not mention that my friend, Ronda, quilted Conestoga Stitches for me. It was a challenge for her as well as sometimes it's hard to find quilting designs that work in 1/2 inch spaces! She always does an awesome job. 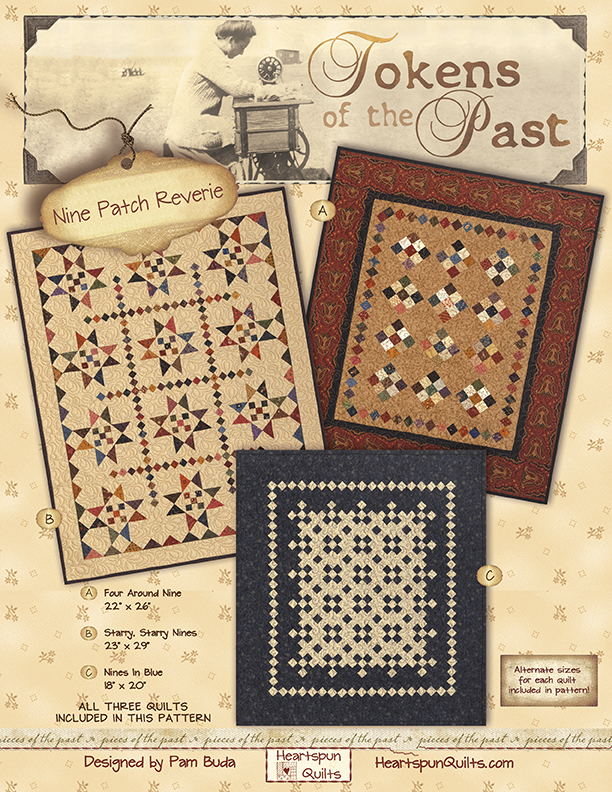 I do not have plans to make a pattern for Conestoga Stitches because I honestly don't think many quilters would want to make those 11/16th HSTs.....right? But...never say never. 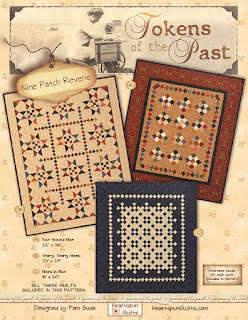 Don't forget that shops all over the U.S. are getting ready to offer you my new Conestoga Crossing Block of the Month. Ask for it at your favorite quilt shop! 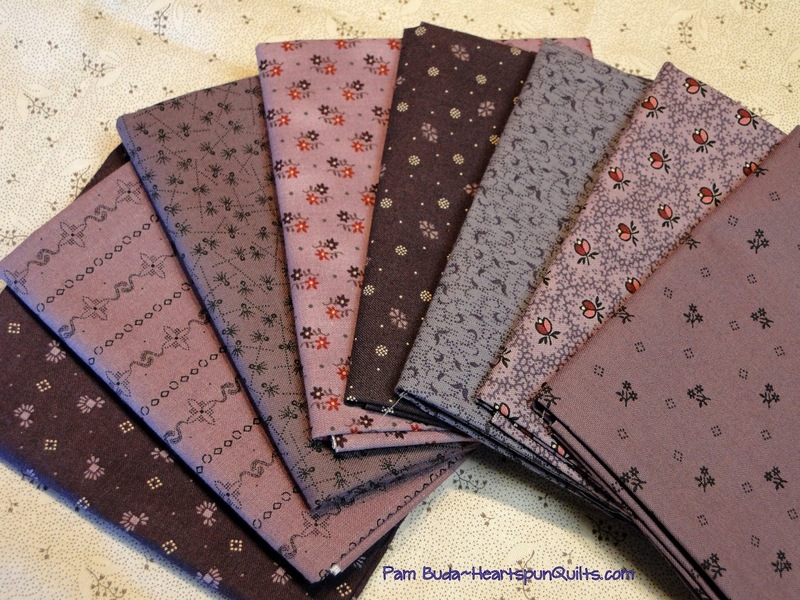 I wanted to talk a bit about my Pocket Patchwork Sew-Alongs. I love them, and had every intention of offering one this year, but family commitments, heath issues, surgeries (my husband had his knee replaced too), and a very busy work schedule caused my good intentions to offer a Sew-Along to be constantly postponed. I just wanted you to know that I have not abandoned nor forgotten about it. This year, life has gotten in the way of a lot of plans, and it just happens to us all. I actually have the next Sew-along designed but have no idea when I can make it happen. I'm thinking about a new approach because TIME is always an issue for us all. (We've talked about this before!) So, I'll be thinking of a new way to fit it in. It's important to me to continue, and I do so enjoy them as it really is a fun way to interact with all of you...and I miss it!! Starry, Starry Nines ~ An All Time Favorite!! As a designer, I love all of the quilts I design. Now and again, you have some that become your favorite, and Starry, Starry Nines is sure a favorite for me! It has lots of Nine Patches, Ohio Stars and a fun border that looks like Flying Geese but isn't and is great to piece together. Add the scrappy fabrics and I ask you.....what is not to L*O*V*E? 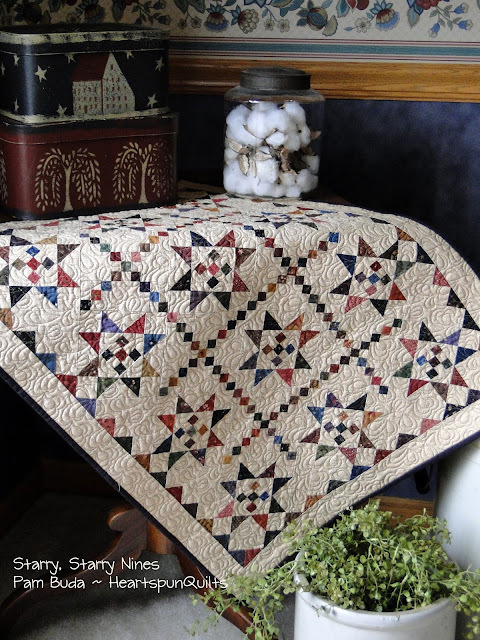 We have made a few kits of this yummy quilt in the small, wallhanging size, all in an assortment of my fabrics. The quilt size is 23" x 29". 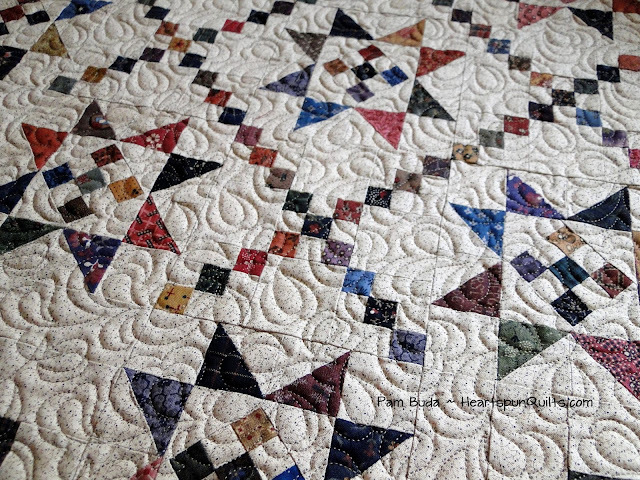 Starry, Starry Nines in just one of three quilts featured in the pattern Tokens of the Past: Nine Patch Reverie! 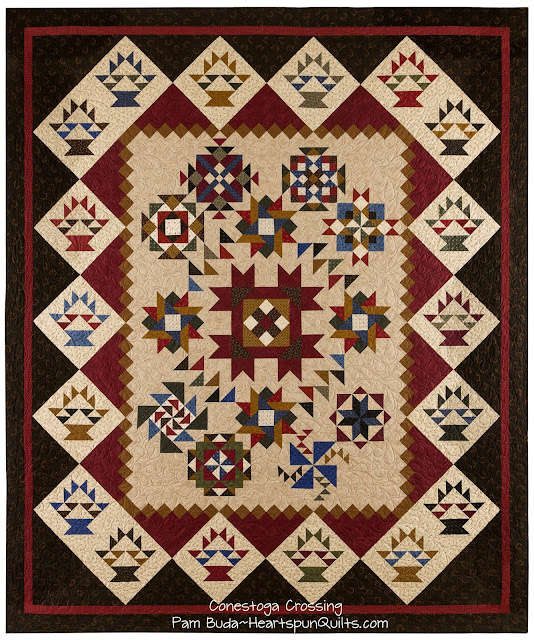 The pattern includes directions for all three quilts with alternate sizes or versions. You can order the kit with fabric alone, kit with pattern, or kit with pattern and backing fabric. Click here to read all details and order info.